Location was good, only 15mins walk to the harbour. Lovely pool and comfortable sun loungers. Very quiet at night, no traffic noise. Plenty of storage in the room and bathroom. Good facilities in the room, the kitchenette was well equipped. Comfortable beds and pillows. Breakfast on the poolside terrace was very nice with plenty of choice and good coffee. Friendly hosts. Although the poolside snack bar was closed after breakfast it wasn't a problem at all as we took drinks from the fridge in our room to enjoy by the pool. There's a big Supermarket just down the road. We enjoyed our stay here and would definitely recommend. Very nice hotel. Good breakfast. Nice wifi connection. Nice pool. Quiet and peaceful. Beautiful flowers in the garden. The Marigoula Village is secluded yet really close to Skopelo's main town - aka Hora. The stuff was super friendly, especially Maria and the lovely Rebecca who were serving the breakfast. Fantastic time here. George was an unbelievable host. Offered to pick us up from the port about a 1km walk and insisted on dropping us on our return. Coming lex is really well run. Breakfast was a treat. Great base to explore the town. Explore more than just the port. Everything was ok: breakfast, cleanliness, parking, facilities. The Marigoula family gave us an extremely warm welcome. 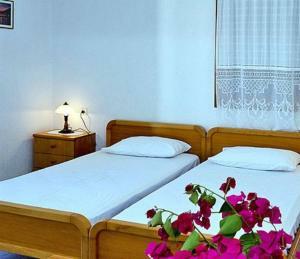 This is the perfect place for people who like traditional Greek holidays. Quiet - no fuss - nothing flashy. Just simple Greek hospitality ! Staff were very pleasant and helpful, including an unexpected free ride to the port the day of our departure, which was very kind. 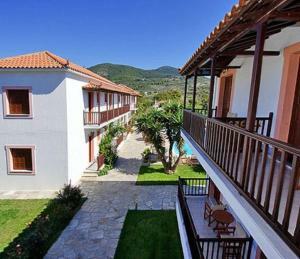 Lock in a great price for Marigoula Village – rated 8.8 by recent guests! Located in Skopelos Town, Marigoula Village features a swimming pool and a furnished sun terrace surrounded by a well-tended garden. It also includes a poolside snack bar and offers air-conditioned units with free Wi-Fi and a balcony. Overlooking the garden or the mountain, the rooms, studios and bungalows of Marigoula have a fridge and a TV. Each features a private bathroom, while some also include a well-equipped kitchenette with dining table and small electric oven. A continental breakfast is served daily at the dining area. Guests can also relax at the wooden sun loungers by the pool and enjoy a cold coffee or a refreshing drink from the poolside bar. Skopelos Port, where restaurants and shops are featured, lies within 2,300 feet from Marigoula Village. Stafilos Beach is 2.5 mi away, while Panormos Beach is at a distance of 3.1 mi. Car rental services can be provided and free parking is possible on site. 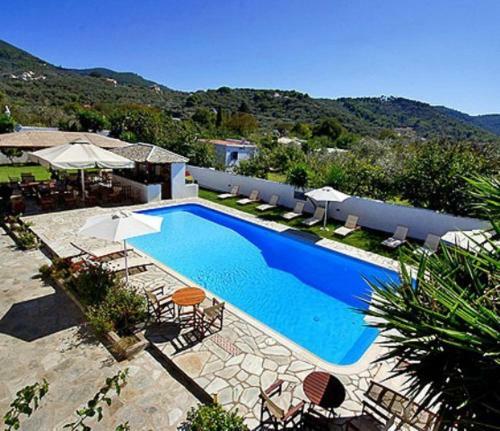 뀐 Located in the top-rated area in Skopelos Town, this property has an excellent location score of 8.4! 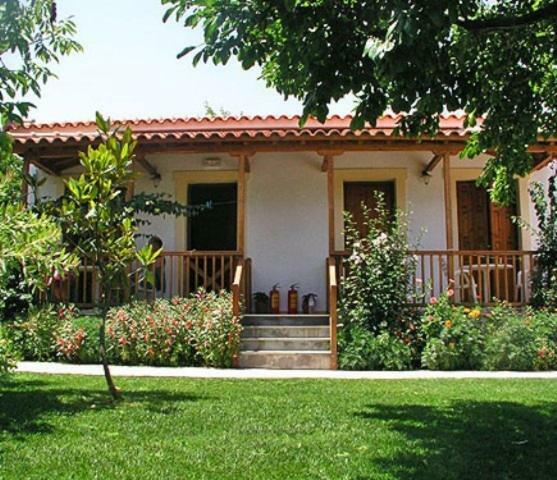 When would you like to stay at Marigoula Village? 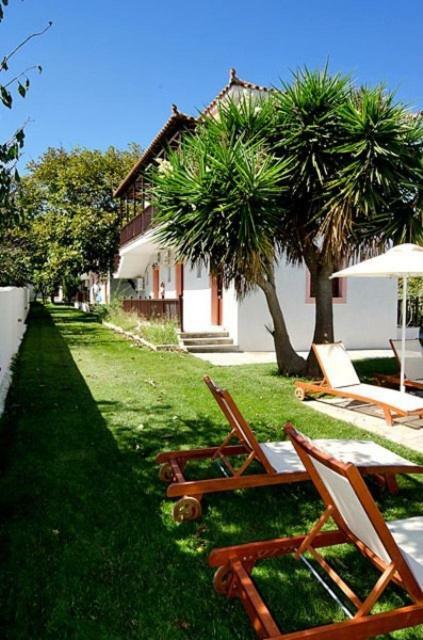 Featuring a well-equipped kitchenette, this air-conditioned studio opens to a balcony overlooking the garden and the mountain. 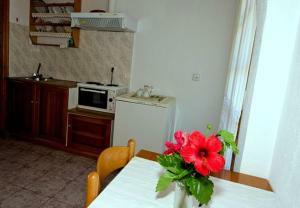 A small electric oven, a TV and free Wi-Fi are available. Please note that this studio can accommodate an extra bed for a child upon request at no extra charge. Air-conditioned room with a balcony overlooking the garden or the mountain. A TV and free Wi-Fi are available. Please note that this room can accommodate an extra bed for a child upon request at no extra charge. House Rules Marigoula Village takes special requests – add in the next step! Marigoula Village accepts these cards and reserves the right to temporarily hold an amount prior to arrival. There was something smelling not so good when we arrived, but this was solved fast. Not that central a location. The bar could have been open in the afternoon. Hard beds. No complaints about Marigoula. We just don't like noisy families or selfish guests staying near us. Luckily they left after a few days and we enjoyed a tranquil holiday for the best part. The advert clearly stated that a pool bar and refreshment "snack bar" would be available. The photos also show this. This is completely misleading as there is no pool bar. Instead, breakfast is served at the bar area until 10am and then it remains closed for the remainder of the day/night. This was very disappointing as we had booked this hotel on the basis that we could enjoy and evening drink with other guests before heading into town for dinner. Or perhaps a snack by the pool during the day, which is exactly what the advert says. The fact this was so misleading on the advertisement was a real let down and extremely cheeky - very unfair misleading advertising. Loved the atmosphere at the hotel. The owners were so kind and welcoming. They layout of the buildings and even a small church inside the place really gives a feeling of a Village. Even met the Jaja (Grandma) Marigoula. Nice pool, good location. Good cleaning and helpfull staff.